Mike Ullery | Daily Call The new mural overlooking downtown Piqua continues to take shape on the side of the building at 101 E. High St. Painted by Franklin-based artist Eric Henn, the mural depicts a member of one of the Ohio Woodlands tribes from the Piqua area, alongside a scene from the Miami-Erie Canal. PIQUA — A new mural depicting Piqua’s early history is taking shape at 101 E. High St., the building that houses the Piqua Daily Call, Quint Creative Signs, and Miami County AAA. The mural depicts a member of one of the Ohio Woodlands tribes from the Piqua area, alongside a scene from the Miami-Erie Canal. The artist, Eric Henn, is based in Franklin, just south of Dayton. Henn began prepping the 20-by-80-foot, second-story area in May. Henn’s artistic career began with painting surfboards and T-shirts in Virginia Beach, Virginia. Since then, the scale of his work has grown to include decorating water towers, industrial tanks and feature walls at malls and amusement parks internationally. “I’ve worked from Los Angeles to Australia,” he noted. Locally, his work can be found on Marathon tanks in Findlay, at Flag City, U.S.A., and in murals in Miamisburg and Franklin. Contributors for this project include the Miami County Foundation, George B. Quatman Foundation, Hartzell-Norris Charitable Trust, and the Neils & Ruth Lundgard Foundation. According to Ruth Koon, who is active in many community causes, the mural might be the first of more to be considered for the downtown area. After the first project is complete, the committee will be looking for additional sites and ideas for future projects. ”We don’t want it to look cluttered or busy,” Koon said. “We’re not doing it to be trendy, but believe it creates a very positive image and memory of our town,” she added. For more about Henn and his work, check out his Facebook page, Eric Henn Murals, or his website at www.erichennmurals.com. https://www.dailycall.com/wp-content/uploads/sites/30/2018/09/web1_MU2_0048_cmyk.jpgMike Ullery | Daily Call The new mural overlooking downtown Piqua continues to take shape on the side of the building at 101 E. High St. 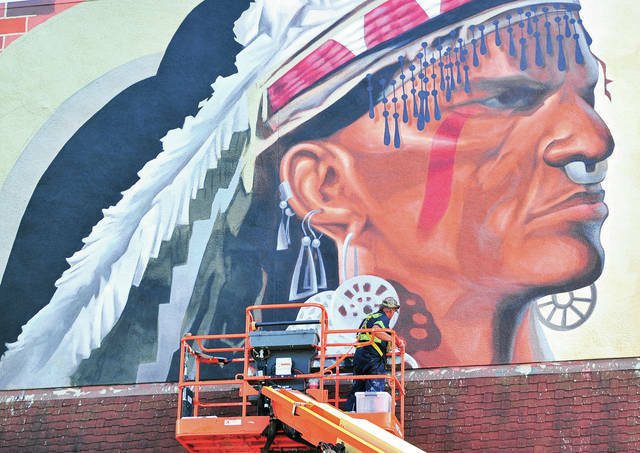 Painted by Franklin-based artist Eric Henn, the mural depicts a member of one of the Ohio Woodlands tribes from the Piqua area, alongside a scene from the Miami-Erie Canal.